Division of Hematology, Department of Internal Medicine, Mayo Clinic, Rochester, USA. standard first follow-up visit to assess treatment response. could be easily implemented in clinical practice. between 2000 and 2007 were considered for this study. federal regulations and the Declaration of Helsinki. -3, -2; and melphalan 140mg/m2 on day-1 (BEAM). or last follow-up, whichever occurred first. baseline characteristics at day 100 is included in Table 1. Table 1. Baseline patients’ characteristics at day 100 (N = 134). 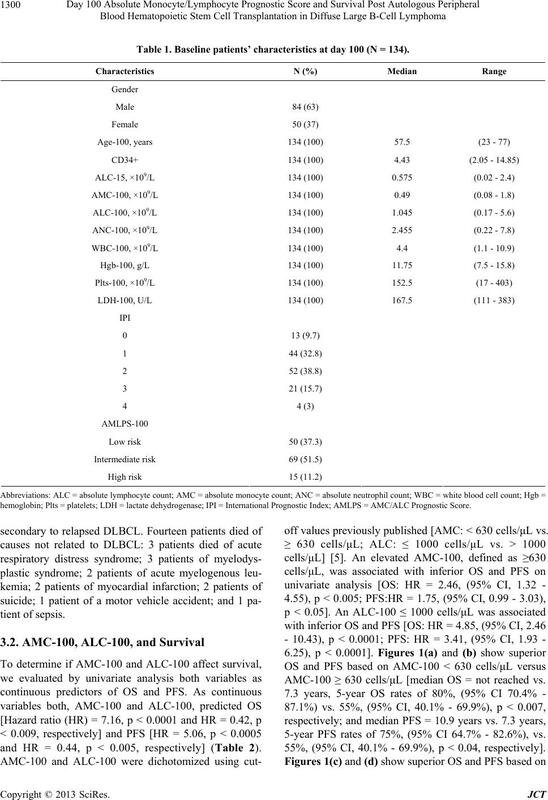 hemoglobin; Plts = platelets; LDH = lactate dehydrogenase; IPI = International Prognostic Index; AMLPS = AMC/ALC Prognostic Score. and HR = 0.44, p < 0.005, respectively] (Table 2). 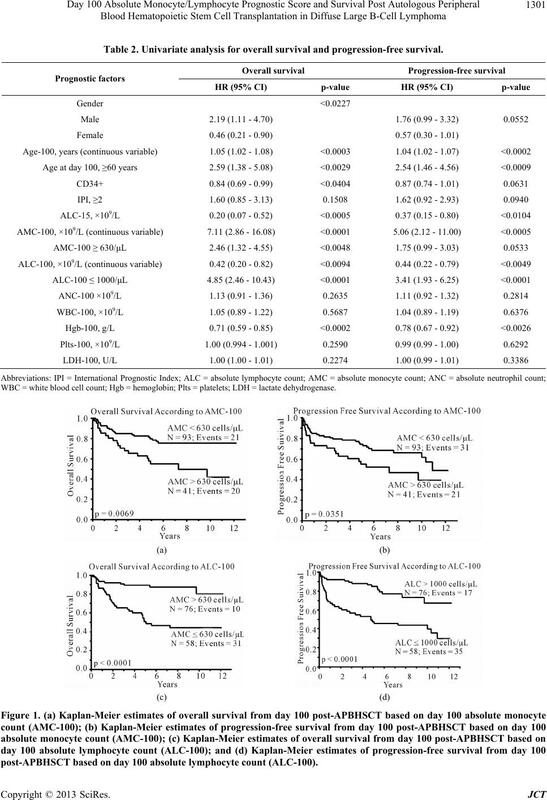 off values previously published [AMC: < 630 cells/μL vs.
AMC-100 ≥ 630 cells/μL [median OS = not reached vs.
5-year PFS rates of 75%, (95% CI 64.7% - 82.6%), vs.
55%, (95% CI, 40.1% - 69.9%), p < 0.04, respectively]. Table 2. 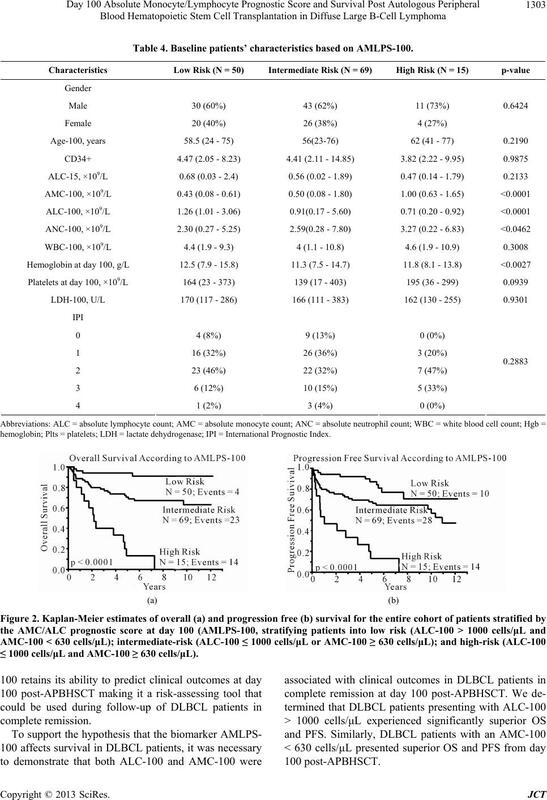 Univariate analysis for overall survival and progression-free survival. WBC = white blood cell count; Hgb = hemoglobin; Plts = platelets; LDH = lactate dehydrogenase. 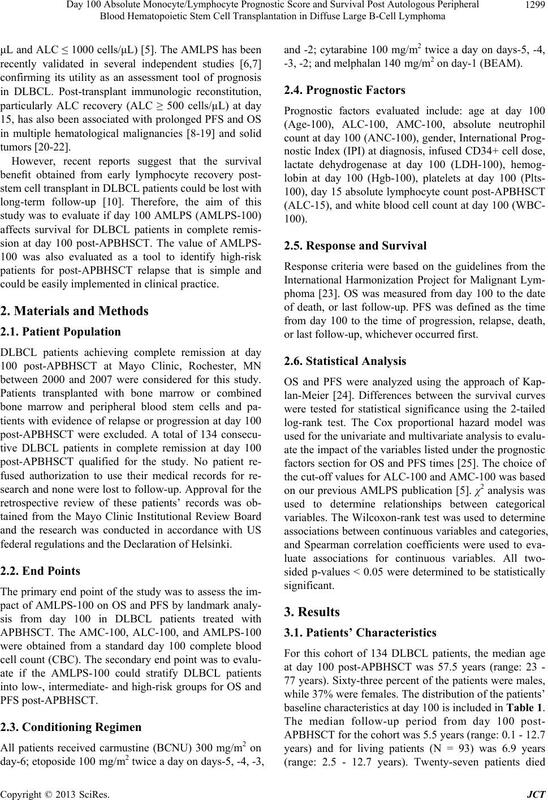 post-APBHSCT based on day 100 absolute lymphocyte count (ALC-100). 33.6% - 58.9%), p < 0.0001, respectively]. dictors of PFS (Table 3). in complete disease remission at day 100 post-APBHSCT. 5-year OS of 13% (95% CI, 3.4% - 40.5%) (Figure 2(a)). 3.4% - 40.5%) (Figure 2(b)). Table 3. Multivariate analysis for overall survival and progression-free survival. Abbreviations: IPI = International Prognostic Index; ALC = absolute lymphocyte count; AMC = absolute monocyte count; Hgb = hemoglobin. Table 4. 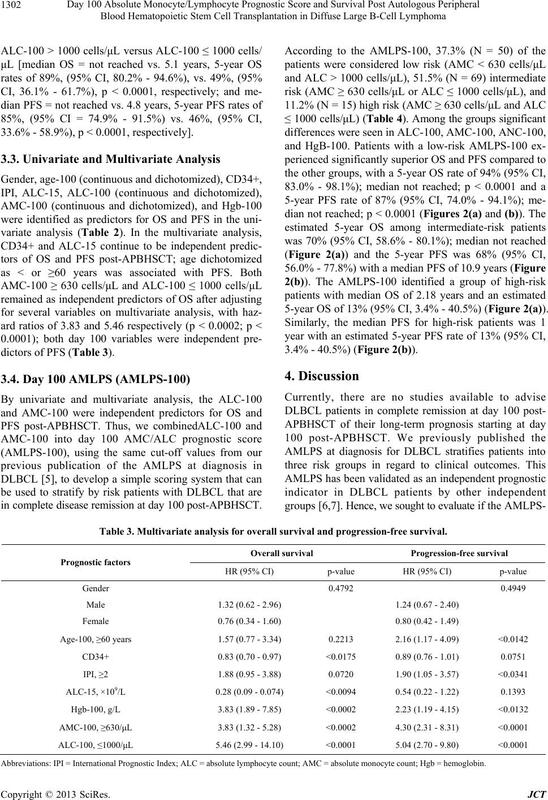 Baseline patients’ characteristics based on AMLPS-100. hemoglobin; Plts = platelets; LDH = lactate dehydrogenase; IPI = International Prognostic Index. ≤ 1000 cells/μL and AMC-100 ≥ 630 cells/μL). 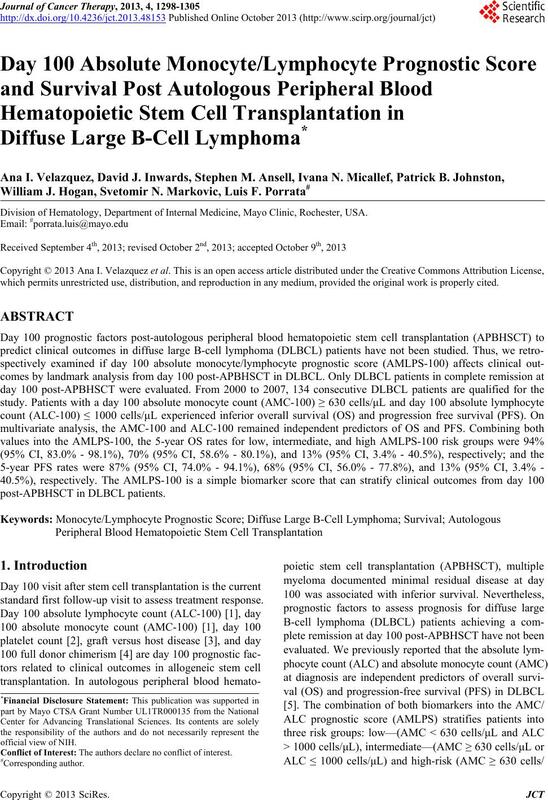 plete remission at day 100 for the landmark analysis. sarily represent the official view of NIH. L. J. DeCook, M. Thoma, T. Huneke, N. D. Johnson, R.
 B. Bolwell, B. Pohlman, R. Sobecks, S. Andresen, S.
Transplant,” Bone Marrow Transplantation, Vol. 33, No. S. G. Holtan, W. J. Hogan, M. A. Elliott, S. M. Ansell, D.
 N. Batty, E. Ghonimi, L. Feng, L. Fayad, A. Younes, M.
 C. Keane, D. Gill, F. Vari, D. Cross, L. Griffiths and M.
 D. K. Hiwase, S. Hiwase, M. Bailey, G. Bollard and A. P.
Vol. 14, No. 7, 2008, pp. 116-124.
row Transplantation, Vol. 14, No. 7, 2008, pp. 807-816. D. G. Stover, V. K. Reddy, Y. Shyr, B. N. Savani and N.
splantation, Vol. 47, No. 1, 2012, pp. 82-87. Hematology, Vol. 11, No. 3, 2006, pp. 165-170. C. Joao, L. F. Porrata, D. J. Inwards, S. M. Ansell, I. N.
 H. Kim, H. J. Sohn, S. Kim, J. S. Lee, W. K. Kim and C.
plantation, Vol. 37, No. 11, 2006, pp. 1037-1042. H. Kim, H. J. Sohn, S. E. Kim, H. J. Kang, S. Park, S.
row Transplantation, Vol. 34, No. 1, 2004, pp. 43-49. L. F. Porrata, M. A. Gertz, M. R. Litzow, M. Q Lacy, A.
search, Vol. 11, 2005, pp. 1120-1218. No. 3, 2006, pp. 629-633. 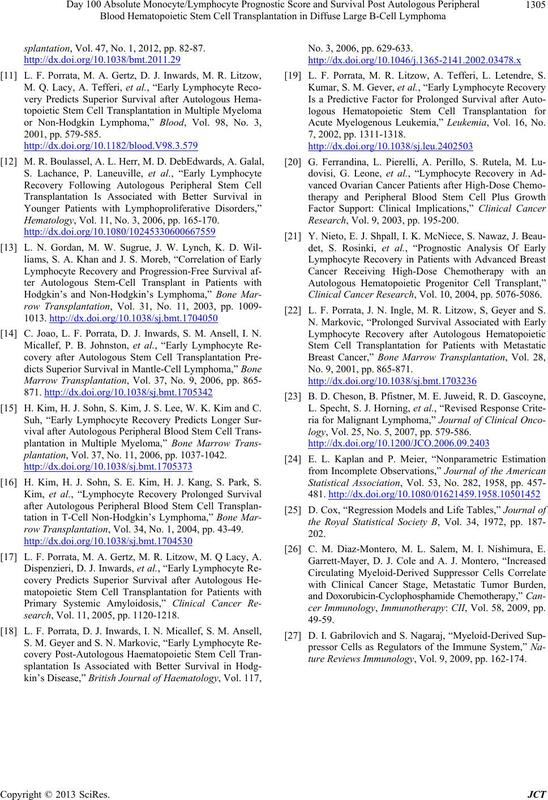 L. F. Porrata, M. R. Litzow, A. Tefferi, L. Letendre, S.
Acute Myelogenous Leukemia,” Leukemia, Vol. 16, No. Research, Vol. 9, 2003, pp. 195-200. 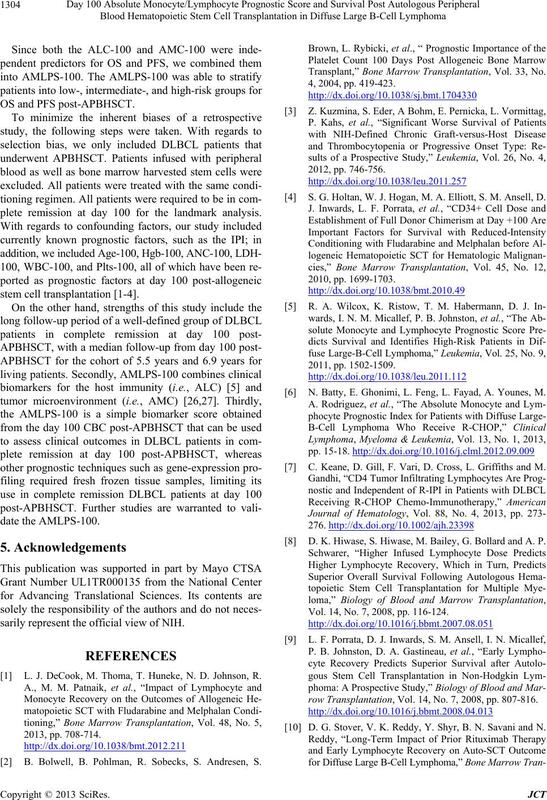 Clinical Cancer Research, Vol. 10, 2004, pp. 5076-5086. L. F. Porrata, J. N. Ingle, M. R. Litzow, S, Geyer and S.
No. 9, 2001, pp. 865-871.
logy, Vol. 25, No. 5, 2007, pp. 579-586. C. M. Diaz-Montero, M. L. Salem, M. I. Nishimura, E.
cer Immunology, Immunotherapy: CII, Vol. 58, 2009, pp. ture Reviews Immunology, Vol. 9, 2009, pp. 162-174.